from our Cognac Tasting Collections. Cognac is a strong alcoholic beverage obtained by distilling white wine from the region of Charente, or the Cognac region, in France. Cognac can be subdivided into classes according to different denominations, with a focus on the maturation period of the Cognac. Very Special (Very Superior) or ***, is used as a name for Cognacs with a minimum maturation period of 2,5 years. Very Special Old Pale (Very Superior Old Pale), is used as a designation for cognacs with a minimum maturation period of 4 years. 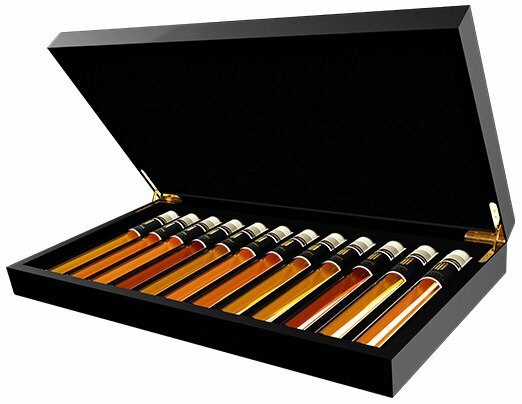 Réserve is used by cognac makers to indicate the special quality of a cognac. XO stands for Exceptionally Old, which is used as an indication for Cognacs with a maturation period of at least 6 years. Napoleon is an unofficial age indicator for Cognac and comparable to XO quality Cognac, which means that the youngest spirit has matured for at least 6 years in oak barrels. The name is based on the Cognac house of Courvoisier and the French Emperor Napoleon. The more calcareous the soil, the more refined the Cognac. Grande Champagne has the most calcareous soil of all Cognac districts. The Grande Champagne delivers the best of cognac quality and lies at the heart of the cognac region. Only cognac of Grande and Petite Champagne, in which Grande Champagne has to make up the largest proportion (50%), can be called' Fine Champagne Cognac'. The house Rémy Martin is the only big Cognachouse that selects only grapes from the two best crus: Grande Champagne and Petite Champagne. Mostly the Cognac species from different districts are mixed together, so that they have the best characteristics of each one. The most sophisticated Cognacs are manufactured by smaller specialised producers. By far the majority of Cognacs are composed of more than 2 districts; the label may then only contain' Cognac'. Only certain grape varieties are and may be used for the production of Cognac. The grape varieties used are Colombard, Folle Blanche and in most cases the Ugni Blanc (also known as St-Emilion). Cognac has many well-known brands, which of course can also be obtained from the Tasting Collection, a selection of cognacs offered by Tasting Collection. Rémy Martin is a Cognac which has been produced since 1724 by the French company of the same name. In the early 1990s, a merger was formed with the liqueur producer Cointreau, which led to the creation of one of the largest French wine and beverage group: Rémy Cointreau. Courvoisier is a Cognac brand with a Japanese owner. The Couvoisier Cognac consists mainly two of the best cru's, the Grande Champagne and the Petite Champagne, of the Cognac region. The largest Cognachouse of France, founded in 1765 by the Irishman Richard Hennessy, who was an officer in Louis XV's army and after his service began trading in Cognac. At the moment Hennessy is certainly the hippest Cognac within clubs and the urban scene. The house Martell, founded in 1715 by the Englishman Jean Martell, who started trading Eau de Vie in the French Cognac area, still buys Eau de Vie from Cognac farmers in the various Cru's of the Cognac region. The family business Frapin, established since 1270 in Segonzac with 300 hectares of vineyards in the heart of the Grande Champagne, where predominantly the Ugni Blanc grape grows. From growing the grapes to bottling their Cognac, everything happens on this' domaine', making it a Grande Champagne Premier Grand Cru de Cognac. Augustin Vallet started his Cognac business in 1866 in Jarnac Champagne, the heart of Petit Champagne. Now, 150 years later, the sixth generation of Laurent Vallet still makes high quality Cognac. From growing the grape to filling the bottles, everything happens on the Chateau. Montifaud is a leading Petit Champagne Cognac, which matures much longer than legally specified. All white spirit wines not originating from the Cognac regions mentioned above (but produced elsewhere in the world) are generally referred to as' Brandy'. 'Brandy' is an English corruption of the Dutch word brandenwijn and a collective name for the various distilled white wines (among other things): Cognac and Armagnac. Cognac comes exclusively out of the French departments of Charente and Charente Maritime. Armagnac is located south of the Cognac, south-east of Bordeaux in the department of Gers. The area is divided into the areas Bas-Armagnac, Tenareze and Haut-Armagnac. Calvados is an alcoholic beverage similar to Cognac, only obtained by distilling apple cider instead of white wine. The drink comes from the department of Calvados in Normandy.